It’s been a week now after the 5th Europen YoYo Championship which was held in Budapest, Hungary just like last year, but this time it was a 3 day event between 21st and 23rd February. I’d like to give a brief of what has happened at this huge event, through some points of view. This will be a serie of posts – after every contest we visit. First of all I’d like to say that Budapest is really a perfect place for EYYC. This is the capital city of Hungary, full of life, and lots of opportunities for tourists as well – more than a hundred hostels to sleep in, countless restaurants and bars for eating and drinking, hunders of things to see even if you didn’t plan sightseeing and nice people everywhere. 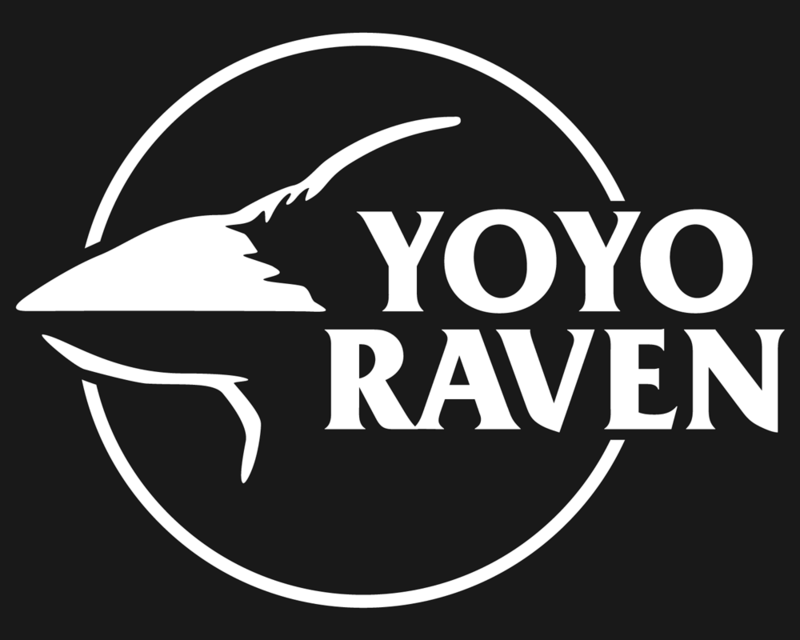 And when it comes to yoyo community, it can be even more! The venue was Petőfi Csarnok Music Hall, the same as last year but since then it was renovated. This place is almost perfect: can be easily reached by public transport, has a huge capacity, enormous free place for practicing, big stage with professional lighting, you can buy drink (and food) inside the venue. We had also live stream from more than one angles, so the people left at home could feel the magic of EYYC. What I personally didn’t like that much, that sometimes it was a bit cold and that the projectors didn’t work for the whole weekend. The time schedule was available about 2 weeks before the contest. But we all know the schedule can be changed by the organizors any time, and it happened here too. After all everything went fine, only some techinal issues could interrupt the flow of the event. On the first and second day it was even shorter than it was planned. The raffle was skipped at all and some programmes were swithced, but I didn’t get the feeling that nobody knows what’s going on. Like every year there were special guests at the EYYC. This year we had the opportunity to meet the amazing and crazy-talented Steve Brown who has invited the 5A style. His performance was way too funny. 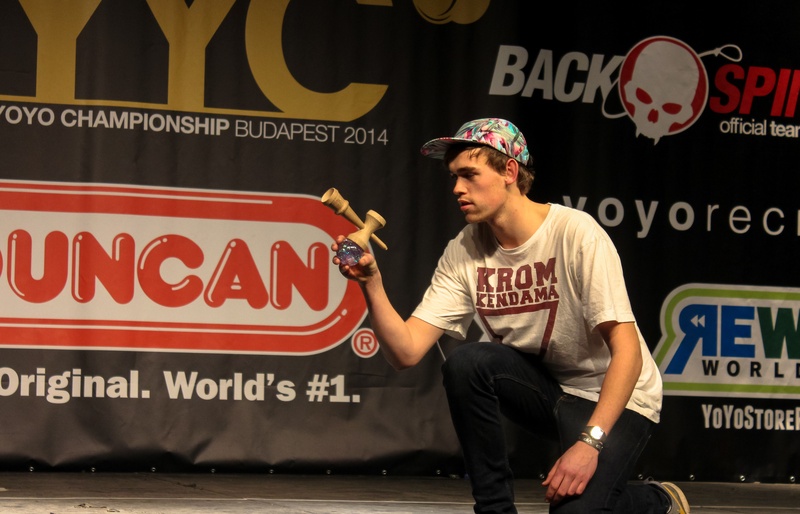 Two other amazing players were invited from another skilltoy world – Philip Eldridge and Thorkild May representing Krom Kendama. These Dannish guys introduced us into the challanging world of Kendama’s, through their stunning performance at stage and also on workshops next to YoYoRaven booth all three days. Of course many players visited Budapest from all over the world – Japan, Mexico, Kazakhstan, Hong Kong, the USA, Singapore, China and plenty European countries. Many people gathering together with the same passion, how could it be wrong? Personally I think this event is not just for competing, but meeting with the players and friends from all over the world. For most of us there are people from the community who we only meet at such big contests. So after all it’s a huge party and feelgood event for 3 days – away from the everyday routine. The first day was a bit tough for someone who’s only watching, since it was the 1A Prelim day with more than 90 contestants, 1 minute routine per each. Between the groups trick ladder was held as well. The second day was more exciting because of the 2A, 3A and 4A and 1A Open categories’ finals. At the end of the day we could cheer for new champions in every category – except for 2A, where Dave Geigle hasn’t been beaten yet. One of the most memorable freestyles that day was the new European champion of 4A, Quentin Godet’s amazing and risky routine. And so was Paul Kerbel’s winning freestyle in 1A Open, these are really worth to watch again. The third day was the most waited because the 27 final contestants in 1A was fighting for the most recognised title in Europe. There were 12 national champions (included János Karancz, 2013 World Champion) and 15 player from prelims on the stage. From my point of view it was almost impossible to guess the top rankings, and I think everybody was surprised at the award ceremony. The new European Champion in 1A is now Carlos Braun from Germany, who’s performance was outstanding. At every good contest there is an even better after party. I’m not that big party face but I often visit these drinking occassions as well to hang out with people. At EYYC there was a party on Friday evening as well, but we didn’t go there, so let’s stay at the real afterparty on Sunday evening which was held in Hétkert, in the middle of the city. The most memorable minutes were for me the Asian beer battles, and after that the on-the-couch-sleeping Kengo Kido which really explains how much beer can an Asian bear. Can’t wait for WYYC in Prague!